LUENEBURG, Germany -- Hedy Bohm had just turned 16 when the Nazis packed her and her parents onto a cattle car in May 1944 and sent them from Hungary to the Auschwitz death camp in occupied Poland. One of the black-uniformed men on the ramp was likely SS guard Oskar Groening. Now 93, he goes on trial Tuesday in a state court in the northern city of Lueneburg on 300,000 counts of accessory to murder. Two of those deaths were Bohm's parents, who are believed to have been killed in the gas chambers immediately upon arrival in Auschwitz. Groening's trial is the first to test a line of German legal reasoning opened by the 2011 trial of former Ohio autoworker John Demjanjuk on allegations he was a Sobibor death camp guard, which has unleashed an 11th-hour wave of new investigations of Nazi war crimes suspects. No pleas are entered under the German system and Holtermann would not comment on his defence ahead of the trial. "According to the indictment that was accepted there is a certain probability he did something criminal," Holtermann said. "We will have to see what the court decides." In 2005, he told Der Spiegel magazine he was assigned to "ramp duty" -- positioned to guard luggage taken from Jewish prisoners upon their arrival at the death camp. Groening was assigned to "inmate money administration" -- keeping track of the money that the Jews and others were forced to forfeit upon arrival in the camp. 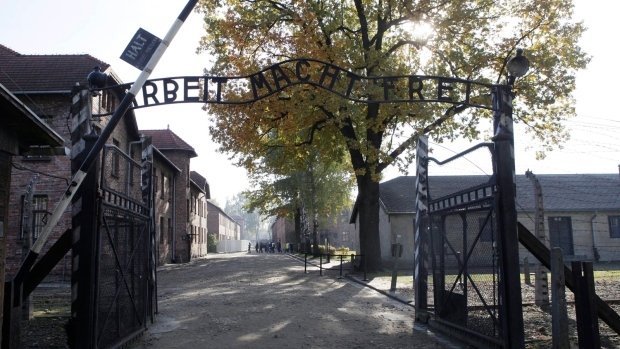 Her father, who was disabled, was sent one way with other men, and she and her mother were motioned to go another direction -- which turned out to be directly to the gas chambers. But in the confusion Bohm and her mother were separated. As she ran to catch up with her, a Nazi guard with a rifle blocked her path and said "no, you go to the right."